I went into all of this backwards. Which in hindsight I am very glad. It’s always been this way with me. I feel more free as an artist. Jump in first, think later.I had no formal training with beadwork. I never read a book. I relied on a few people willing to show me things of importance. Visual is best. I became very close to one shop keeper. She had asked me if I did wraps. I thought to myself, the sandwich? So glad I didn’t have the chance to answer. She explained wire wrapping, tools and showed me. Practice is key. Now that the Wrap necklace was in, I was making these all the time. A new type of designing on 48 inches of chain. Silver had become the new Gold. Prices were soaring. I learned about the different metals, price wise. For me, I like gold filled. Still value and really pretty. Buying by the inch or gram…depending on where to purchase. Gold filled wire for wrapping and how it comes in different gauges. Why? Bead’s have different size drill holes. That’s my wrap on Amethyst. Really interesting and funny too! This is natural talent,,, Love your visual jewelry! 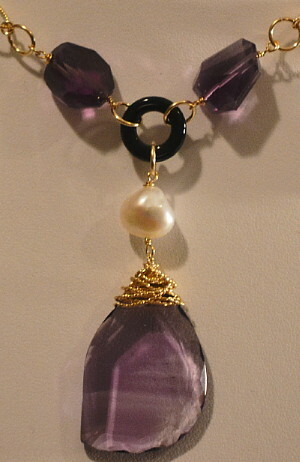 Love your blog and jewelry.. Not only talented but funny too! This is a great weblog!!! I like your weblog very much and I’ll subscripe to it if you post more articles like this! Do you like EK Voetbal 2012 or do you wanna know the EK uitslagen take a look on my profile! Thanks homepage, I do plan on maintaining this for a long time! Best of luck to you too!